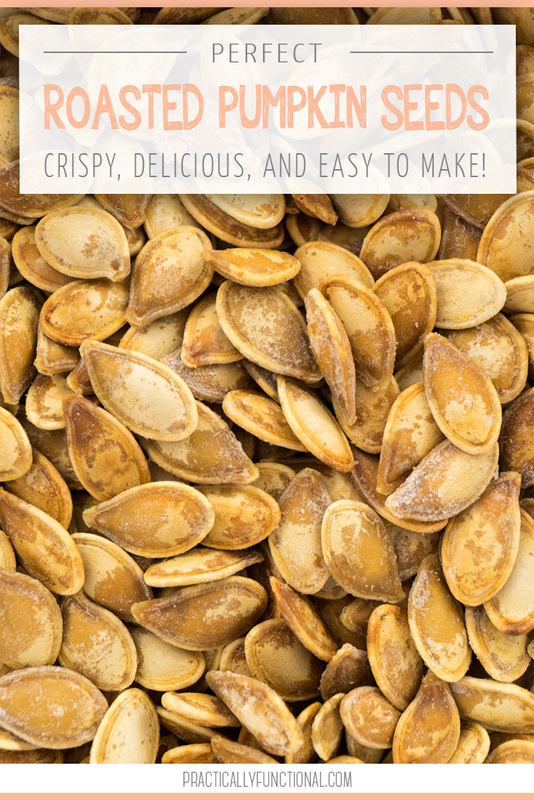 One of my favorite things about fall is making roasted pumpkin seeds; they are crispy and delicious, and so easy to make! 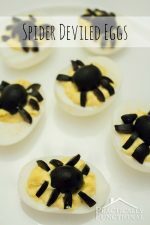 You can make them in any sort of flavor, but I really like them plain with just a little olive oil and salt. Today I’m sharing my absolute favorite recipe for making the perfect roasted pumpkin seeds, plus a secret trick for making sure they end up crispy and crunchy instead of soft! 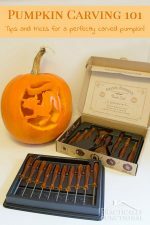 You can make roasted pumpkin seeds with the seeds from any pumpkin: a pie pumpkin or sugar pumpkin, or even the jack o lantern you carved for Halloween. 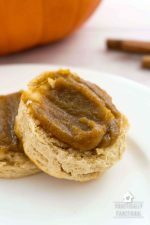 While the flesh of pie pumpkins or sugar pumpkins are sweeter and better for cookin (like for this homemade pumpkin butter recipe), the seeds are all pretty much the same, so use whatever pumpkin you have on hand! 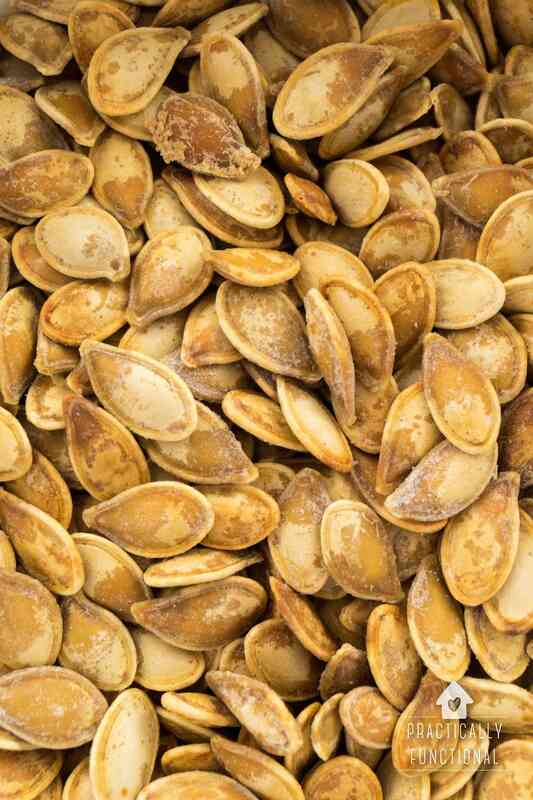 NOTE: On average, pumpkins have about 500 seeds in them, which is anywhere from 1/4 cup to just over 1/2 cup. But the measurements in this recipe don’t need to be perfectly exact, so just use whatever pumpkin you have. I had two pie pumpkins for my pumpkin butter recipe, so I just used the seeds out of those for this recipe. Start by cutting open your pumpkin and scraping out all of the seeds and strings. 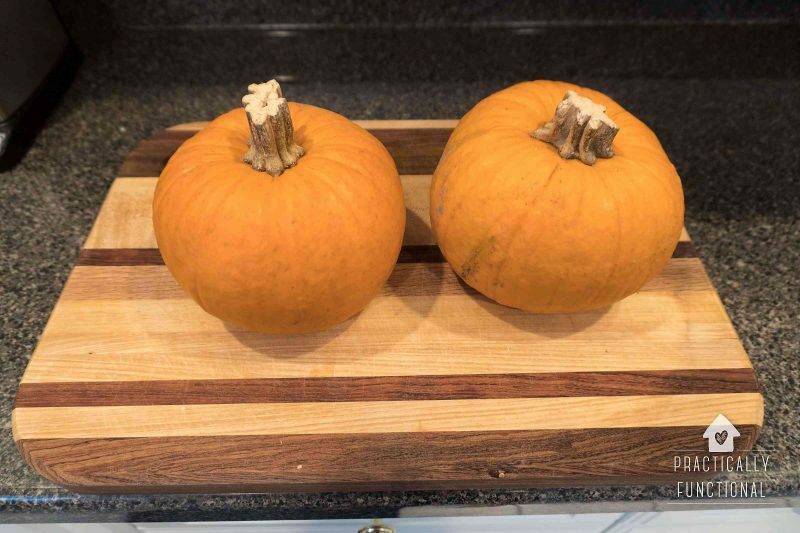 If you are using the seeds from a pumpkin you plan to carve for Halloween, just cut the top off the pumpkin and scrape the seeds out. 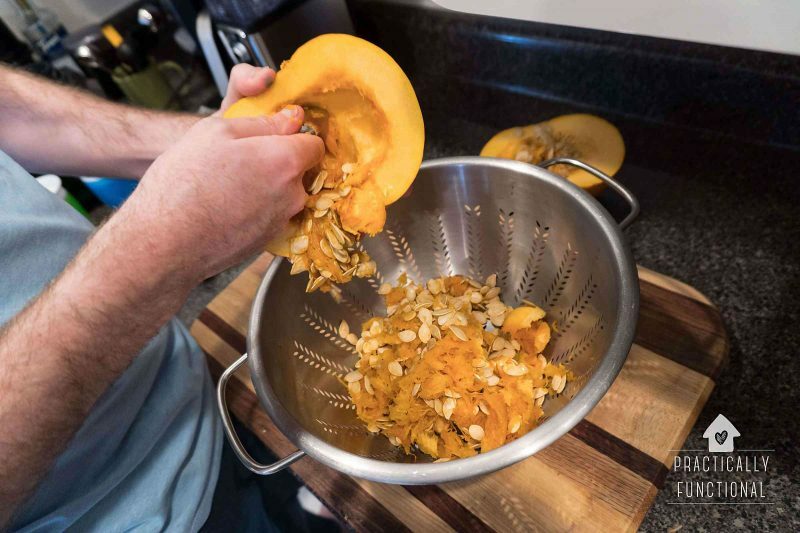 If you are going to use a pie pumpkin or sugar pumpkin and use the flesh for pumpkin pie or pumpkin butter, then just cut the pumpkin in half and scrape out the seeds. 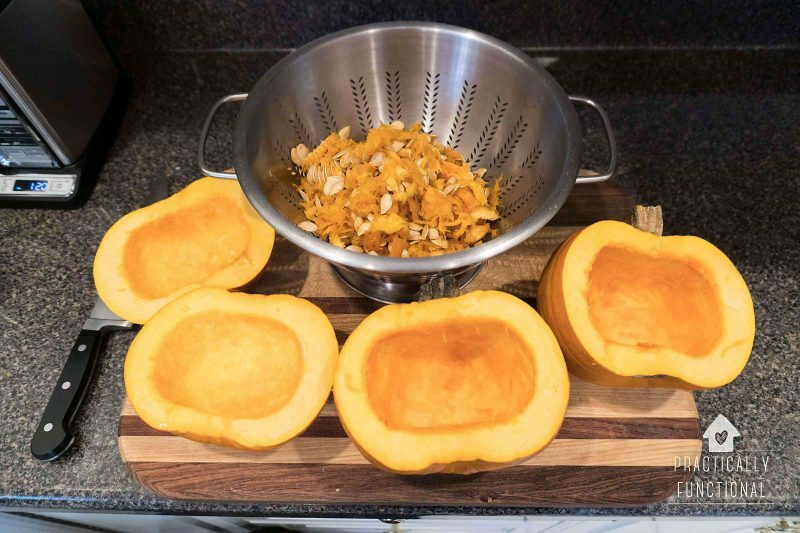 Use a metal spoon to scrape the seeds, strings, and other gunk out of the pumpkin cavity and put it in a colander. Clean all of the strings and pumpkin guts off of the seeds. 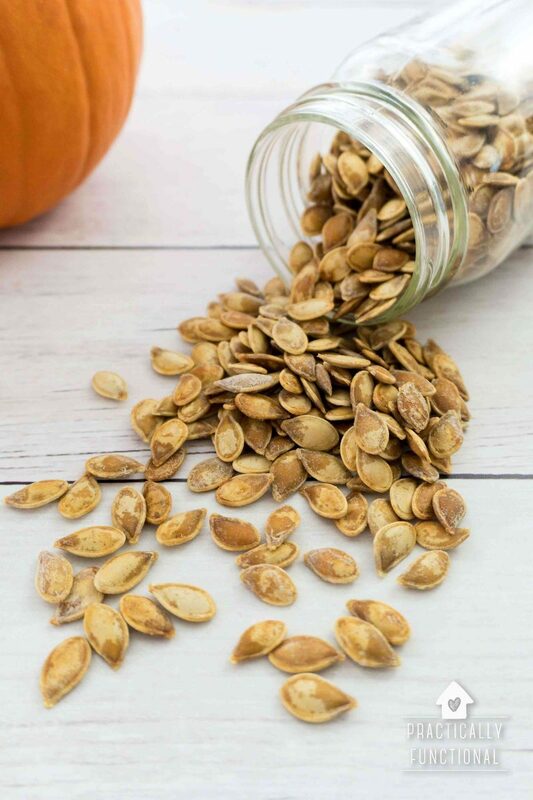 Make sure you clean the seeds really thoroughly; if there are any pumpkin bits left on the seeds when you roast them, it can make the seeds soft instead of crispy. The other secret to crispy pumpkin seeds is to boil the seeds first, before you roast them. 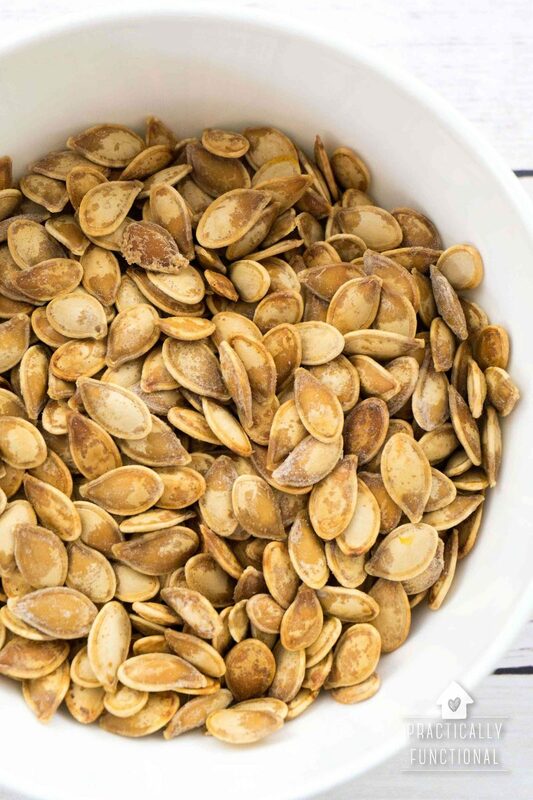 For every 1/2 cup of pumpkin seeds you have, put the seeds and 2 cups of water in a saucepan, plus 1 Tbsp of salt, and bring to a boil. 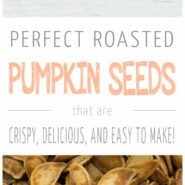 This allows the salt to get inside the seed shells so that they’re even more flavorful once they’re roasted! 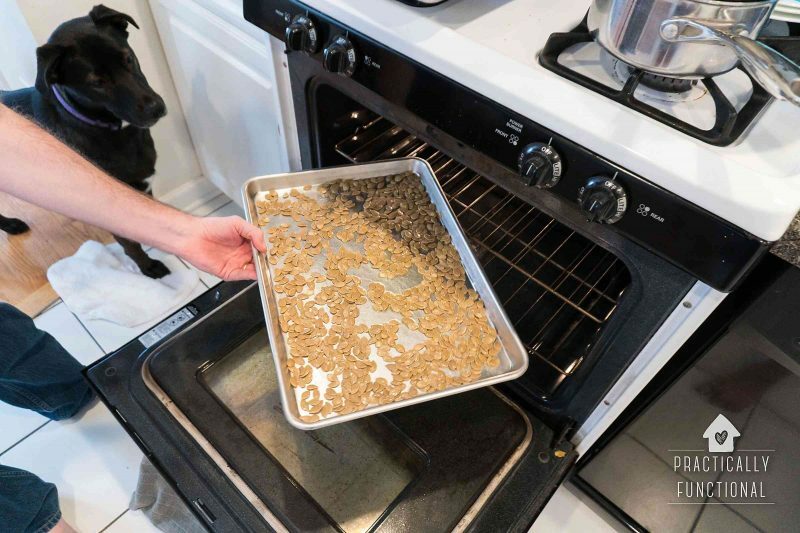 While the seeds are boiling, preheat the oven to 400 degrees F. Boil the pumpkin seeds for ten minutes, then remove them from the heat and drain them. Toss the seeds in a bowl with a tablespoon of olive oil and a dash of salt, then spread them out on a baking sheet. Put them in the oven on the top rack until they just start to turn brown, about 15-30 minutes. Once the seeds start to brown, they’re done! 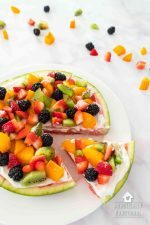 Pull them out of the oven and let them cool on the baking sheet until room temperature. Then enjoy! You can store the roasted pumpkin seeds in an airtight mason jar for a long time, but at least in our house, they tend to be eaten up pretty quickly! Cut open your pumpkin and scrape out all of the seeds and strings. Put them in a colander and rinse until clean and free of pumpkin pieces. For every 1/2 cup of pumpkin seeds you have, put the seeds and 2 cups of water in a saucepan, plus 1 Tbsp of salt, and bring to a boil. 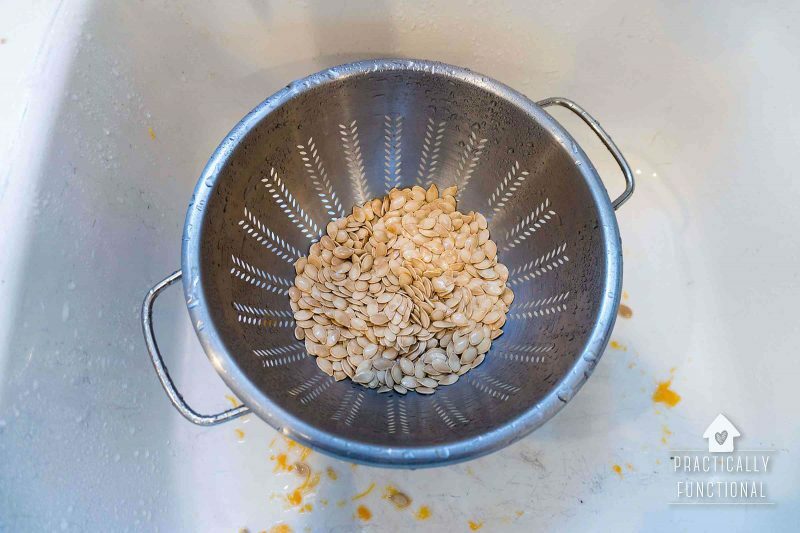 Boil the pumpkin seeds for ten minutes, then remove them from the heat and drain them. Toss the seeds in a bowl with a tablespoon of olive oil and a dash of salt, then spread them out on a baking sheet. Put them in the oven on the top rack until they just start to turn brown, about 15-30 minutes. Pull the seeds out once they start to brown and let them cool to room temperature. 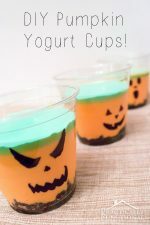 Store the roasted pumpkin seeds in an airtight container like a mason jar if you don't plan on eating them right away.